Recent statistics estimate that there are 24.9 million people in situations of forced labour globally. It can affect businesses large and small. Every responsible business should train their staff how to prevent, detect and deal with forced labour to mitigate the risks to their own operations and supply chain. Our e-learning modules provide an engaging and interactive low-cost solution enabling your staff to work through at their own pace and location. Practical guidance supported by video and animation will lead your staff through the training. There is no formal assessment, instead interactive exercises check and reinforce knowledge. Understand how to start taking preventative action to minimise the risk of forced labour within your organisation. Our e-learning modules can be purchased through our partner Eukleia, visit their website to find out more, request a free trial and to make a purchase. £20 per user for up to 50 licences (excludes cost of Learning Management System (LMS) for those who have an in-house solution). £30 per user for up to 50 licences (includes cost of running course through Eukleia LMS). 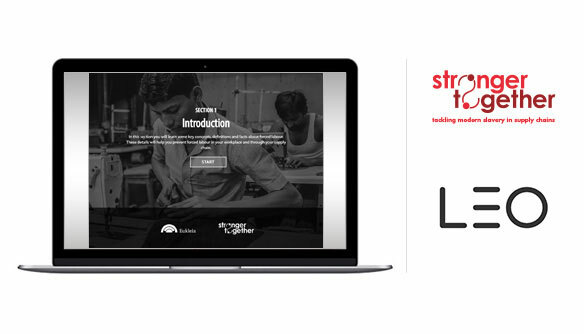 Stronger Together offers in-house training and consultancy services to meet your organisation’s specific needs, and support you to tackle modern day slavery within your business and supply chains. Our training and support are delivered in any business, in any sector, in any country, by our network of expert trainers, consultants and lawyers. Find out more. Download resources including in-depth toolkits, interactive checklists, multi-language worker posters, information leaflets and many more.